Morocco has been leading on this issue in support of health and sustainable development by focusing on production efficiency and pan-African cooperation. Morocco has both responsibly managed phosphate resources (a crucial element for fertilizers) and kept prices down, and forged agreements with neighboring countries in order to make Africa a producer of crop-specific fertilizer products rather than simply an exporter of raw material. Promoting access to fertilizers in Africa could make a huge dent in the continent’s food security problem. This forward-thinking development strategy is echoed in Morocco’s Green Plan, adopted in 2008 to make Morocco’s agricultural sector more sophisticated. The reform package “is comprised of 1,500 projects requiring, until 2020, more than $10 billion to implement.” Agriculture has a significant impact on Morocco’s GDP and accounts for around 38% of the national labor force, yet before the Green Plan, output was less coordinated and less resilient to weather. The Green Plan includes major projects: building dams, expanding access to irrigation systems, and coordinating land use strategies; and has also sought to minimize inefficiencies in Morocco’s agriculture. Farmers have been encouraged to shift production for crops that better fit the climate and terrain, with programs for planting fruit and olive trees in former grain fields. Small-scale farmers are also being helped with organizing cooperatives and information-sharing to improve yields and returns on production. Morocco is also working to promote local value-added food production to create new and better jobs in the country – food product exports increased by 19.5% from January-to-May of 2014 compared to the previous year. Morocco is working to become a more efficient, modern, and sustainable agricultural producer, relying on its inherent strengths and cooperation with its neighbors. This will not only improve the lives of agricultural workers in the country, but it also provides an excellent model for reform in Africa. Food security and sustainable development are enduring challenges for Africa. 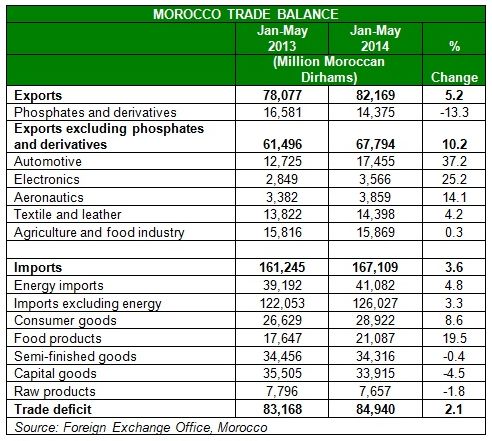 The Moroccan strategy is one that could bear fruit throughout the continent.